The Sri Lankan squad to take on India has been announced and there are quite a few surprise omissions from the squad. 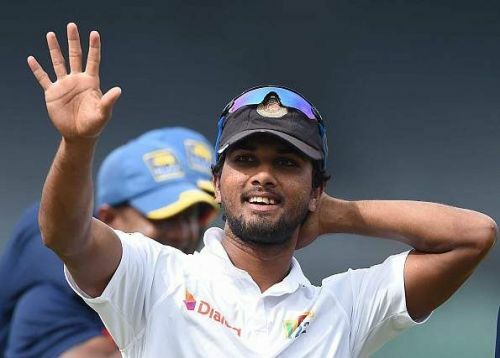 Young batsman Kusal Mendis has got the axe, along with opener Kaushal Silva and fast-bowler Nuwan Pradeep. Allrounders Dhananjaya de Silva and Dasun Shanaka have been named in the 15-member group. Former captain Angelo Mathews, who had been declared fit last week after recovering from an injury also finds a spot in the squad. Both Sillva and Mendis struggled in Abu Dhabi against Pakistan and despite earning the praise of coach Nic Pothas for their work ethic they have been shunted aside for an in-form de Silva who was the top-scorer against an unofficial Test series against West Indies A. What this also means that de Silva could walk out to open the innings along Dimuth Karunaratne. Apart from de Silva another notable name in the squad is that of gritty middle-order batsman in Rohen Silva who impressed the selectors with his form during the A-series against West Indies. The selectors were keeping an eye on Asela Gunaratne and Kusal Perera but both of them were not selected. The series comprises three tests, three ODIs and three T20s over 37 days. The first test will be played at Eden Garden, Kolkata from 16th November. The tour will draw to a close with a 3-T20 match series. Although Sri Lanka were drubbed by India in their own backyard over all the three formats, the island nation have found some belief after having stunned Pakistan 2-0 in the Test series in Abu Dhabi. This series is their chance to extract some redemption as they would be keen to restore some pride after being annihilated by India.